Lucas Baby Cardigan, Hat & Booties. 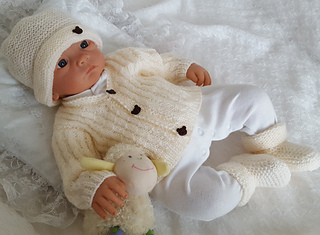 A lovely, easy to knit pattern which makes a super gift for the new arrival. The pattern consists of a v necked, long sleeved sweater/cardigan which has an all over mock cable design throughout. The hat is pull on style and is knitted in garter stitch to produce a warm and cosy fabric which will keep your little one snug and warm. Garter stitch booties complete the pattern which is a relatively quick knit. The pattern is worked flat on two needles and the pattern gives instructions to knit the outfit in two sizes. 0-3 Months and 3-6 Months. The pattern is also suitable for life-size reborn dolls. 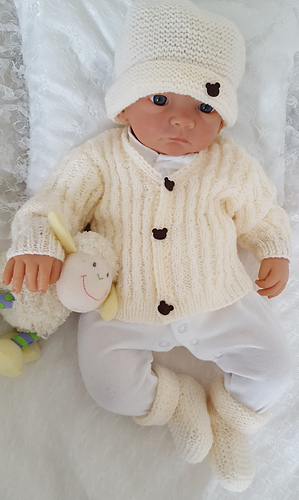 Sets shown are knitted in King Cole Cherish and King Cole Comfort 4ply. Any standard DK or 4ply yarn can be used as a substitute. I have also successfully knitted the set using Paintbox Yarns. 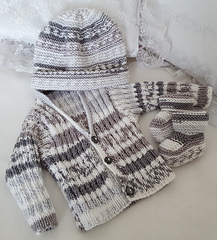 Knitting Pattern by Precious Newborn Knits.